I have to admit these days I am becoming Kaleholic! or If i reword this, since I came to know the goodness and nutritional values in Kale, I am with a mission to include Kale in my recipes and savor it. 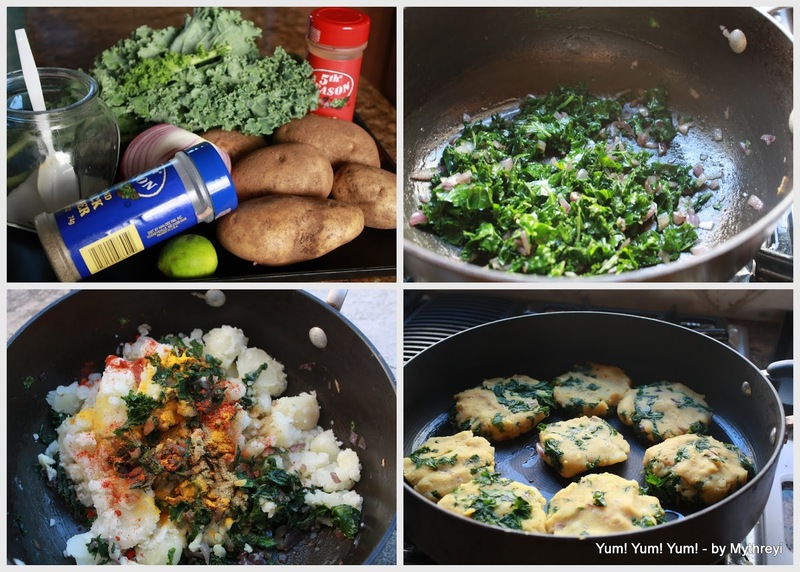 The recent Kale Stir Fry was a big hit at our home (even kids ate it with out whining), and after 2 or 3 times I got bored with this, and wanted to experiment some more . So today I am in search of Kale recipes, and come across this at The Vegan Tummy. I have added bunch of spices to the base recipe to suite for our Indian taste buds. With all those spices in it, you don't even need artificial sauce on the side while serving it. It can be a wholesome Side or Snack, or you can even stuff these in your breakfast burritos or in your burgers.....Go On..! Here is the recipe, Njoy! Wash and Peel the potatoes. Quarter them and boil in 2 cups of water with little bit of salt added to it. Boil for 15 to 20 minutes ( until medium soft). Add 1 tsp Olive Oil to the non stick pan. Once the oil is hot, Add Chopped Onion and cook for 2 min until the onion becomes soft. Now add chopped kale (remove the tough stems before chopping) and saute for 2 min. Add salt and black pepper and saute for another 3 min. ( until the kale becomes wilted). Now switch off the stove and let it cool for 5 min. Chop the boiled potatoes and add them to the kale in pan. Mix the potato and kale mixture thoroughly. Now add turmeric powder, red chili powder, coriander powder and squeeze the lime juice on top. Mix it all together. Now add 2 tsp of Olive Oil to the Pan ( use wide pan). Take 1/4 cup of potato & kale mixture and make them rounds and flatten ( little bit thick) in your palms. and add them to the non-stick pan. Cook them on both side until the cakes becomes little firm and hold it together. Switch off the stove and transfer them to serving plate. Now Njoy this addition of Healthy Kale with potato and spices as evening snack along with Coffee! When there are 2 servings of vegetables in my snack though it is potato and starchy, I don't mind it at all ( even when I am on diet). Do you? Let me know..
Yummy and healthy , nice combo. I think this is a great recipe. I just substituted the potatoes with sweet potato. One thing I would recommend is to have a binding agent so that the potato/kale mixture sticks together. I used a little bit of breadcrumbs and it solved the problem. Thanks for the nice tip Siddarth ! Sweet Potato would be a healthy alternative for Potato in this recipe.